Sometimes, the best-made plans fall apart. That’s what happened last summer to senior Gee M. Paegar, Jr., currently in his last semester of environmental sustainability and history studies at Eastern Mennonite University. Paegar, a native of Monrovia, Liberia, had set up an internship there when the Ebola outbreak suddenly spiraled out of control. His quick decision-making and networking resulted in other opportunities, however. He spent eight weeks with I.M. Systems Group, an environmental solutions consultancy in Rockville, Maryland, and four weeks with the grassroots organization Green Belt Movement in Nairobi, Kenya. 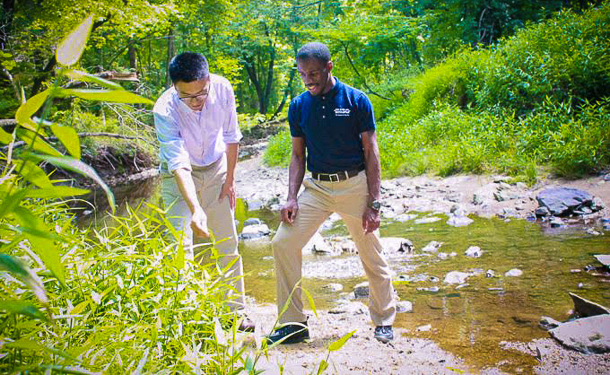 “Both internships equipped me with valuable knowledge and skills in the area of environmental policy, a field in which I’m looking to pursue a professional career,” he said. Paegar hopes to continue to graduate school and then eventually return to Liberia. Here, he talks more about his experiences. How did you set up these internships? I had initially planned to intern in Liberia with the Society for the Conservation of Nature in Liberia. However, because the Ebola outbreak hadn’t been contained, as well as the fact that their operations are based in the areas severely affected by the outbreak, I decided to call off the trip. Fortunately, I found that I.M. Systems Group had once worked in Liberia and partnered with SCNL. 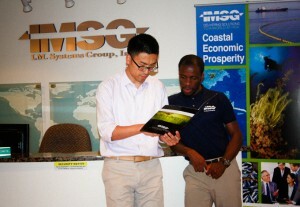 Thus, I used my contacts from Liberia to inquire about the possibility of obtaining an internship with I.M. Systems Group. My credentials were later requested, followed by an interview and I was awarded the internship. 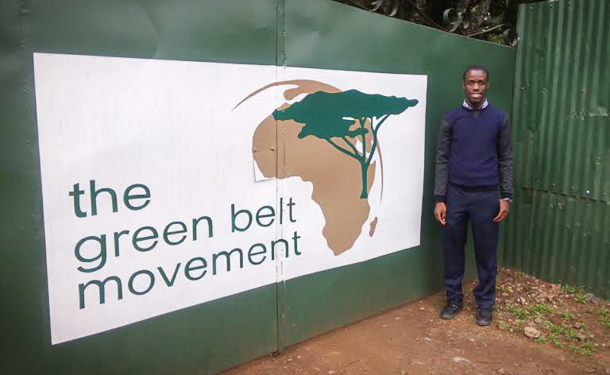 The Green Belt Movement internship came from a recommendation. I sat at the same table as Nobel Laureate Leymah Gbowee, MA ‘07, when she visited campus in February to speak at the International Student Organization Ebola fundraiser. Her family and mine are close friends. When she asked about my summer plans, I indicated that I was seeking an internship to fulfill my practicum requirements. She provided several suggestions, instructed me to e-mail my resume to her, and later introduced me to the directors of the Nobel Women’s Initiative, who recommended me to the Green Belt Movement. What were your responsibilities at I.M. Systems Group? I worked on a research team that reviewed the existing environmental policies, concepts and frameworks in the context of mangrove restoration, climate change adaptation and poverty reduction in the Southeast Asia region. We researched and proposed several projects aimed at providing economic justification to support the restoration of marine ecosystems and coastal habitats in the Philippines, as well as improving the country’s coastal economy. The research was published in a review paper, which assesses the outcomes of several mangrove restoration initiatives in the Philippines and suggests a sustainable solution to future restoration initiatives. What were your responsibilities at The Green Belt Movement? The Green Belt Movement (GBM), founded in the late 1970s by Wangari Maathai of Kenya, empowers communities, particularly women in those communities, to conserve the environment and improve livelihoods. I worked at the headquarters in Nairobi in the climate change and corporate partnership division. The GBM contributes to Kenya’s national climate change consultation group. As Kenya had recently adopted a National Climate Change Action Plan, our task included reviewing the national climate change position papers and identifying questions about the government’s priorities in responding to climate change. These inquiries were not exclusive to the Kenyan context as many involved questioning of global, regional and local policies and policymaking processes that ignore community engagement in decision-making, sustainable livelihoods and environmental conservation. I also helped to review the “Intended Nationally Determined Contributions” policy ahead of the upcoming UN Climate Change Conference in Paris, France at the end of this year. Even developing nations who are particularly vulnerable to the deleterious impacts of climate change (but have done the least to cause the problem) are required to submit this. I also worked on a program to train 400 women leaders from the Great Lakes Region in natural resource management and climate change mitigation/adaptation. These women would in turn train 20,000 individuals from several communities across East Africa. I observed a training session and learned about the approaches utilized by the GBM in its development projects. Can you share a favorite experience with both internships? I didn’t have a single favorite moment or experience. I found every single day exciting. I was motivated by the desire to learn hands-on from seasoned professionals in the field. At the GBM, I was really impressed by the enthusiasm exemplified by the employees. It felt like a big family. Other activities outside of the actual internship experience were also enlightening, like experiencing a different culture while in Kenya. I’m from Liberia, which is in West Africa, and Kenya is in East Africa. The cultures are distinct for the most part, but living for the past few years in the United States, I’ve observed that the fallacy of a monolithic African culture is often perpetuated; therefore, I found it interesting how different we were/are. I love and value diversity so that was exciting. What would you tell a student who wants an internship? This might sound cliché, but I’d tell a student who wants an internship to go for it, and not be scared to step outside your comfort zone. There are a lot of things out in the world waiting to be discovered. As Dr. Seuss said, “You have brains in your head. You have feet in your shoes. You can steer yourself any direction you choose.” You might just stumble upon something you love doing and that could end up being your profession. Approximately 80% of job and internship seekers secure opportunities through networking. Gee proved that networking with family members, friends and professional contacts can be a successful strategy to gain experience. Perseverance and a back-up plan are helpful tools, as well! Give yourself permission to try new experiences and to work with people and organizations you may not have previously considered. The more open you are to different options, the more opportunities you will find. This is so amazing Mr. Paegar. Keep up the hard work as you advance deeply into you career. I pray that the Lord strengthen you with more wisdom and encouragement as you proceed. God bless you my dear brother and friend. Liberia is surely proud of you. Splendid performance. Great work. Congratulations and keep it up. Keep it up! The sky is the limit. Congratulations for the great achievement thus far. I hope that you look into the possibility of joining the humanitarian environment in the not too distant future. I see the passion in you for the career path you’ve chosen. Humanity needs such great talents in shaping this global village we all called our home. You do EMU proud, Gee! Love that alumna and family friend Leymah Gbowee helped link Gee with the Green Belt Movement.